unveils the destination’s 2018 Marketing Plan before hospitality partners in attendance at today’s luncheon, held at the Broward County Convention Center. GREATER FORT LAUDERDALE, Fla. (Oct. 5, 2017) – Greater Fort Lauderdale Convention & Visitors Bureau president and CEO, Stacy Ritter, today announced the expansion of the destination’s global digital and social presence and new research that shows Greater Fort Lauderdale increased its domestic market in 2016 by 4 percent with 12.27 million visitors and increased international visitation by 13 percent over 2015 with 1.01 million visitors while the rest of the country saw a 2.1 percent decrease in overseas visitors. New Bureau marketing initiatives include an increased media spend of $5 million, 25 percent more than last year, with at least 60 percent of the total media budget in the digital space, including multi-lingual digital visitor collateral. To overcome negative perceptions of the recent hurricane impact on South Florida, despite minimal damage to Broward County/Greater Fort Lauderdale, Ritter pledged an early spend of $1 million to defend the winter high season and increase the destination’s presence in key feeder markets in the Northeast, Midwest, Texas and California on social media channels, radio, and television. Greater Fort Lauderdale’s marketing initiatives also include new programming for the Bureau’s Hello Sunny TV to showcase the destination’s growing culinary and beyond the beach appeal, the launch of a fully integrated public relations and social media program, a revamp of the CVB’s website, strategic communications of a new Convention Center project, a new arts and culture map, an international tour operator program and competitive bidding for major sports, LGBTQ, and multicultural events and conferences. 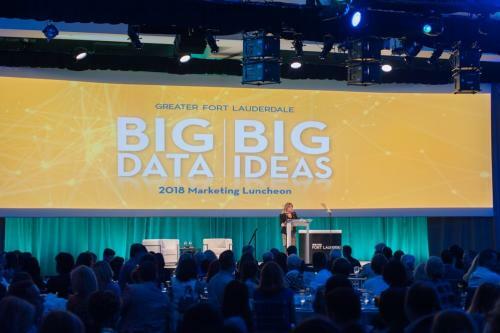 The Greater Fort Lauderdale Convention & Visitors Bureau (GFLCVB) 2018 Marketing Plan is developed and supported, in cooperation with the GFLCVB, Tourist Development Council, and Marketing Advisory Committee, as well as the bureau’s advertising agency of record Starmark, and public relations agency Finn Partners. For more information and a copy of the 2018 Greater Fort Lauderdale Convention & Visitors Bureau’s marketing plan, visit sunny.org/partners. Visuals of the 2018 marketing plan initiatives are available upon request to jessicasavage@broward.org.